If there was ever a product designed to promote procrastination, the epilator is it. It does a good job of setting you up to finish the epilation — later. After so long on the road, my legs had forgotten what a razor looked like, and they were quite beastly. So I’ve been weighing up whether to stay natural (“going feral” as a friend put it) or shave my legs. I like the idea of being hairy — it’s how God made me. Plus I don’t have particularly dark hair, so it’s not very noticeable. David doesn’t particularly mind one way or the other. (Isn’t that wonderful?) And I’m starting to feel comfortable enough in my own skin to discount what our cultural norms dictate. However, one particular outfit got the better of me. Leggings with a shift dress — they just don’t look right with hairy pins. So Mel, who has been epilating or waxing her legs from the very beginning of teenagerhood recommended epilation. When I questioned her about the pain factor, she blithely commented, “You get used to it”. But I was naive, and I drove quickly to the shops to buy the epilator, ducking and weaving my way around the Christmas decorations and Santa grottos that have encroached on the floorspace at the local shopping centre. I grabbed an epilator off the shelf, paid my money and returned home, eager to try out my purchase. Plugging the epilator in at the centre of the living room may not have been wise. Not only was I going to try to master the technique that promised “sensationally smooth skin”, but I had an audience: three small children with a husband hovering in the background, waiting to see how I would fare. Well, let’s just say that I cannot imagine anyone epilating without painkillers. Seriously. Owee! And this was my leg. I cannot fathom using it on a more sensitive part of my body. Can you imagine? Masochistic! The epilator says that it features a “massaging finger for added comfort”, and I’m left wondering “What comfort in the first place?” If you call red-hot sparking metal on your skin as comfort, then perhaps you could add something to it, but I did not experience anything comfortable about using the epilator. But I had an audience who knew the goal. Hair removal. Total hair removal. And my lovely little girls insisted on feeling my leg to let me know where there were patches that I missed. I rapidly ascertained that I was in for the long haul, so I temporarily retreated to our bathroom to scrounge the strongest painkiller that we had in our medicine cabinet. When it had taken effect, I was a bit braver. I managed to grimace a smile as I finished off the lower half of one leg, and I may have even managed a little light conversation with my two-year-old. But that’s the problem. See, I was thorough on one leg, but I haven’t been brave enough to tackle the other one. So for the last three days, I’ve been walking around a bit lop-sided because of all the extra hair-growth on my right leg. And a “sensationally smooth” left leg. I even wore the leggings. Yes, with one hairy leg. I just tried not to look at it or think about the inevitable. It’s not a good look, and yet I procrastinate. The epilator sits forlornly in the bathroom, waiting for my return. And I avoid even going in the room. Maybe I’ll need to source some stronger painkillers, or better yet — an epidural. An epilator epidural — later. I’ll epilater. I just heard myself on the radio! It’s worth it and it DOES make your legs nice and smooth. PLUS – just think, you won’t have to shave or epi for AT LEAST a WHOLE MONTH!! And when it DOES grow back, it actually feels SMOOTH and softer then before, you do not get that sand paper feel. I can’t believe you seriously took pain killers, that’s hilarious…..
Ah poor you (hahaha, you’re so funny at the same time!)! Over here in the US they have Nair (http://www.naircare.com/). It works, but it burns if you leave it on for too long! That’s so funny – i remember feeling the same way when i got my first epliater (though i have to admit i didn’t even think of pain killers!). Having persevered with it (most of the time) i actually have some very large patches on my legs where the hair just never grows back – and the rest is pretty sparse. I definitely think it’s a wonderful device. …. not to mention much safer than trying to defy gravity with one leg up in the shower at 8 months pregnant!! 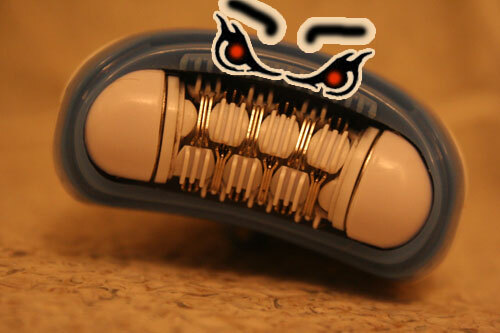 Epilator … not sure why it’s called that, it clearly is a tool of torture. I have no idea why the armed forces use techniques such as water torture … they’ve obviously never been introduced to an epilator! I too must admit to owning one that only saw my legs twice. It is safely ensconced away in a drawer, only to be used again if I am on large doses of morphine or similar. And Lauren your in good company, I too have mis-matched legs at the moment. Maybe we can start a new fashion movement.